A sound designer by day, a scratch Dj by night. Downlow has covered all the bases. From starting life on the London pirate radio circuit he soon became a resident on the infamous "Itch Fm". This was the beginning of an interesting career and as the years went by he has found himself touring all over the UK and playing at pretty much every festival the country has to offer. "I've seen a lot of live bands that incorporate turntables by giving the DJ an 8-bar scratch solo every few tunes, in which the bloke fannies around with the words "yeah" and "fresh" and then falls off the music without a bow. Downlow is a DJ of a completely different calibre - the other day I found him spending hours recording the inside of a piano so he could scratch with the sample. 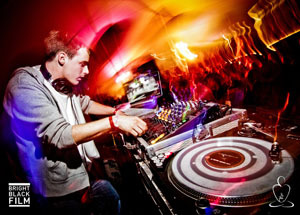 His decks are an instrument, and our sound wouldn't be the same without him." - Dizraeli. www.dizraeli.com A Folk-Hop based crew: Bellatrix (the World Female Beatbox Champ) on bass and beats, Lee Westwood on guitar magic, Cate Ferris on vocals, Paul Gregory on drums, Jules Arthur on viola and keys and DJ Downlow (UK / World Team DMC finalist) on the turntables. Ill-Audio www.myspace.com/illegalaudio Ill Audio are a gaining a strong reputation for their live performances, that are equally as powerful as their inspirational production work. Featuring vocalist Dan Bowskill (Dub Pistols), producer Rob Blake, Downlow on cuts, and S.G on sticks, the collective combine latest technology and production techniques with tried and tested live performance ethics, blurring the lines between DJ set and rock band. He is a 2x UK DMC finalist and hopes to take the title (in the not too distant future). In 2008 he linked up with Invincible Armour and they have been going from strength to strength ever since. Now battling on world-class level the future certainly looks bright.